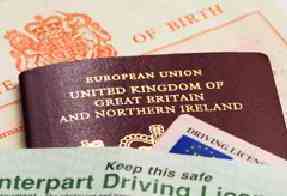 All UK birth certificate supplied are full long form certified copies for England and Wales, Scotland, Northern Ireland and the Rep. of Ireland (EIRE) and include parents names. All births in the UK have been required to be registered since 1837 for England and Wales, 1855 for Scotland, and 1864 in what is now Northern Ireland. As such, these dates mark the start of civil registration. It is believed that between 1837 and 1875 up to 15% of births were not registered civilly, and the child was only baptised, because it was commonly believed that a parish registration was sufficient. Prior to 1984, the birth indexes were arranged by quarter, January and March (March quarter), April to June (June quarter); July to September (September quarter) and October to December (December quarter). A photocopy of a certificate is not usually accepted for official purposes, and so a certificate should be 'full certified copy of an entry of birth', one which gives details of their parents. For a couple marrying abroad as part of a package, their birth certificates will used be required by the tour operators. They may also need to be legalised. Many countries will have this requirement for the wedding, such as Antigua, Australia, Bahamas, Bali, Barbados, British Virgin Islands, Cayman Islands, Cyprus, Dominican Republic, Fiji, Florida, Jamaica, Mauritius, Mexico, Seychelles, Spain, Sri Lanka and Thailand. Please confirm this information with your tour operator or relevant embassy, as requirements can change.